AxisTechnoLabs having good expertise in PHP web application development. We have 20+ well trained and experienced developers team for PHP development. We are working on php web application development since last 2 years. Open Source software is changing IT in a fundamental way with regular increasing competition by connecting their developers directly. This has resulted in some of the most stable and widely used software in the IT history. Today, Open Source initiatives are equally competitive compared with any other proprietary solution frameworks or development platforms and profoundly leaping ahead by way of the approval of clients. AxisTechnoLabs contribution to Open Source are advanced over years in response to growing demands from global clients.Our team has proven that this new development paradigm can produce output of considerable quality & quantity,which has led to massive business interest from our many clients. PHP a recursive acronym for "Hypertext Preprocessor", is an open-source server-side scripting language designed for creating robust and reliable dynamic Web pages for e-commerce and other mission critical Web applications. SimpleXML or SXML is a great extension that makes manipulating XML data a breeze. JSON and SOAP support for web service functionality built into PHP 5 through the JSON and SOAP interfaces which makes PHP a viable choice for complex backend applications. PDO seems to be one of the great mysteries of PHP 5. it allows developer to access their database of choice using a simple, consistent interface that promotes good coding practices and provides important functionality. SPL Standard PHP Library allows userland code to present itself as one of a number of built-in PHP language elements like arrays. SQLite is a simple but full-featured DBMS packs all the punch of MySQL in a format that doesn't require a database server and runs on every platform on which PHP 5 can be compiled. Cake is a rapid development framework for PHP which uses commonly known design patterns like ActiveRecord, Association Data Mapping, Front Controller and MVC.CakePHP is one of the most popular frameworks for PHP development. It's free open-source rapid development framework for PHP. CakePHP provides an extensible architecture for developing, maintaining, and deploying applications. CakePHP has several features that make it a great choice as a framework for developing applications rapidly. Cake is easy to understand and sets the industry standards in security and session handling. CakePHP reduces the cost of website creation and builds applications much faster. It is developed under MIT license so it is free for everyone. Zend Framework, the leading open-source PHP framework has a flexible architecture that lets you easily build modern web applications and web services.Zend Framework is focused on building more secure, reliable, and modern Web 2.0 applications & web services, and consuming widely available APIs from leading vendors like Google, Amazon, Yahoo!, Flickr etc. Developing PHP applications on Zend Framework is made much easier with the integration, code completion, and other ease-of-use features that are built into Zend Studio. Get the time-savings that comes from an integrated framework and toolset by using Zend Studio with Zend Framework. Another key area of focus is on interoperability. Zend works with database vendors to ensure that PHP has consistent database functionality across a wide range of database applications. Some of this work has also had a direct impact on the database developments themselves including Oracle's recent support for database resident connection pooling in Oracle 11g. This can provide massive improvements in scalability for large business-critical PHP deployments. Zend provides valuable input into the support for web services, specifically the SOAP APIs where emphasis was placed on compliance and interoperability. Zend has also provides support for the porting of PHP to new platforms such as our work with IBM to provide PHP support for the System OS operating system. AxisTechnoLabs provides Zend framework based web application. The Apache Server, is the leading choice platform independent web server technology today. Apache is most known web server to host the applications for PHP and MySQL are two leading open-source scripting and database technologies for Web Applications today. Openbiz is a multi-platform compatible PHP system built on a multi-layer architecture that quickly implements business and presentation logic and into XML constructs. Key features include a multi-layer architecture, full onject ortient design, configurable objects, data aggregation, basic and advanced data operation, and many others. AxisTechnoLabs team is experienced in using Openbiz to create the applications in various domains. Joomla is an innovative Content Management System(CMS) & dynamic portal engine that helps web designers design and build state-of-the-art websites.Joomla! is used all over the world to power everything from simple, personal homepages to complex corporate web applications. Zen Cart is an open source e-commerce solution based on the PHP programming language and a MySQL database. Zen Cart offer a very long list of features that we can use to maintain a professional, robust shopping cart web site for an unlimited number of products. Global E-Commerce Ready, with that it provides support support for multiple of languages,taxes,shipping methods,currencies and payment methods. Customer Status Modes, with that it provides unrestricted shopping support. X-Cart shopping cart software is based on PHP Smarty templates, this makes it very flexible and easy to modify. The data is stored in MySQL database. W3C XHTML 1.0 compliance of X-Cart storefront out of the box. X-Cart is a turnkey package. Installation is handled by web-based step-by-step wizard to make the system running immediately after receiving it. X-Cart is search engine friendly. A merchant can specify meta tags and define custom URLs for product and category pages that results in higher search engine rankings. Robust feature rich ecommerce shopping cart software is a key in online business success. Its potential can be multiplied many times if accompanied by coherent resources & services to give a hand on the way to online success not leaving you alone when operating live ecommerce website. Drupal is an open source software package that allows easily publishing, managing and organizing a wide variety of content on different web sites, including Social Networking Sites, E-Commerce Application, Intranet Application etc. AxisTechnoLabs has highly proficient team of Drupal PHP developers they take care of customer requirement and make sure that our customers and satisfied. AxisTechnoLabs Provides Drupal website, Drupal CMS, Customization of Drupal themes and many more such facilities to our customers. Magento e-Commerce development means latest professional open-source e-Commerce solution providing novel tractability and assurance.It is also known for its robust platform for e-commerce applications. Magento's standard architecture gives the complete control to the merchant online and produces no restraints on the business flow or the processes involved. hire dedicated PHP developers Call on our expert team for PHP development, Iphone and Mobile development. Fill out the form on the right, give us a call at +91-9825950990 or contact us today to receive your free consultation. 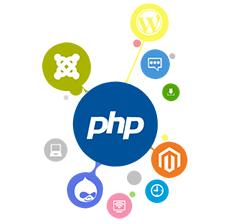 PHP development company provides you best solutions for your business needs.